This column was written by Scott Keenan, a CBS Producer in Dallas. We moved to Fort Worth from my hometown of Chicago about four years ago. We didn't know much about Texas before we moved here and were a little apprehensive. Much to our surprise we love it. The people are warm and genuine and the culture and cowboy lifestyle makes it a fun place to raise children. But the pick up trucks. I have a problem when it comes to the Texas pick up truck. They are everywhere, they are big and, at the risk of stereotyping, there are a lot of aggressive drivers behind the wheels. My daily commute can be down right dangerous and that's on a clear day. Since the pick up is the official vehicle of Texas, one can imagine the sneers I received from the neighbors when I pulled into my driveway with a new Prius. 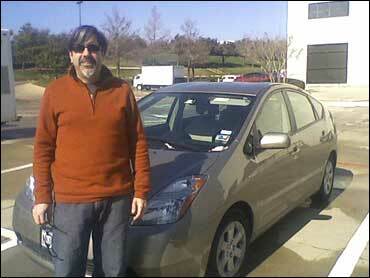 Most of our neighbors have accepted their Yankee carpetbagger, but a Prius? They humored me as I gloated about the car's performance and sound system, but they really didn't get it. But today was my day. North Texans' were smack dab in the middle of one of the worst ice storm in years. Trees, sidewalks and roads are covered with an inch of pure ice. Texas is not built for ice. They do their best with sand and salt, but nothing compares to Chicago where the military-style deployment of the snow-removing forces is impressive. But my commute today was gleeful. As the local stations were doing wall-to-wall ice storm coverage, showing accident after accident, I was carefully driving my 33 mile route to the CBS News Bureau. I passed pick up truck after pick up truck fishtailing from right to left. Some were parked along the shoulder and some in the fast lane, not moving at all. All you could hear was the high pitch sound of spinning rubber meeting the ice. The ice was winning. Meanwhile my front wheel drive Prius was cruising effortlessly along the expressways. I made it to work in record time (no traffic), no sliding, no fishtailing. Prius revenge. Will my neighbors discover a new found respect for the Prius and their Yankee neighbor? Probably not, but I'll get a smile and a "Bless your heart." Did I mention that I got 58.6 MPG on the way in?